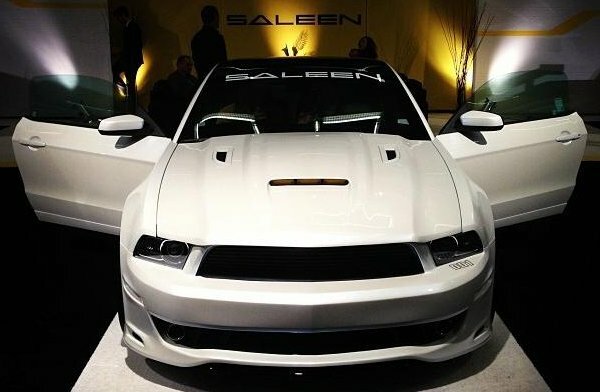 The Saleen SA-30 Mustang is the latest in a long history of high performance Ford pony cars tuned and customized by Steve Saleen’s company and this new model is currently on display at the 2013 LA Auto Show. The SA-30 Mustang is based on the current Saleen 302 Mustang that packs either 440 horsepower through simple add-ons and tuning or 625 horsepower package with the help of forced induction to make that monster power. The SA-30 Mustang also wears the same aggressive body kit from the non-anniversary models that adds a unique grille, front fascia, hood, side sills, rear spoiler, rear lower fascia and wheels from the 302 Mustang. Allowing the SA-30 Mustang to stand out from other 2013 and 2014 Saleen 302 Mustangs is a unique “Tire Smoke” Pearl White exterior paint that covers much of the body and the Saleen wheels, unique Saleen Speedlab yellow and black graphics and the new high tech Saleen Frost-Touch Glass panoramic roof. This glass roof goes from being perfectly clear like the glass roof on other new Mustang models to being opaque enough to block out some 40% of light (and 98% of UV rays) at the push of a button. Just to be clear, the Saleen Frost-Touch Glass doesn’t have a piece of cloth that slides across the inside to block the light – the glass itself changes its appearance to essentially transform into a solid roof when the sun is too much. The SA-30 is the first model to feature this new technology but we can expect to see this cool high tech roof on more Saleen Mustangs soon. Also, the rear glass of the Saleen SA-30 Mustang sports this electronic dimming technology so the SA-30 owner can have almost no light coming through the roof or back glass with the push of a button. While the outside of the Saleen SA-30 Mustang doesn’t differ much from the other new Saleen 302 Mustang coupes, the inside is a whole different story. The SA-30 features a unique interior layout with black leather and white Alcantara along with a serialized dash plaque, unique interior badging and SA-30 branded carpeting. SA-30 Mustang buyers can also opt for a 2-seat interior package that removes the rear seat to make room for a racing style rear paneling system that separates the cabin from the trunk with a leather wrapped chassis brace sitting where the rear seat had once been. The suspension system of the Saleen SA-30 Mustang is the same as the non-30th anniversary Saleen 302 Mustang but these few special edition pony cars will wear the yellow powder coated big brake package to improve cornering through incredible braking attributes. The Saleen SA-30 Mustang follows in the footsteps of earlier limited edition anniversary models including the SA-10 in 1993, the SA-15 in 1998 and the SA-20 in 2003 with just 10 units of each produced (there were only 9 SA-10 Mustangs built but original plans expected 10). The Saleen SA-30 carries a base price starting at $95,000 but considering the long list of options available on all Saleen Mustang combined with the fact that only 10 of these 30th anniversary Mustangs are being built – I would guess that the actual selling price of each one of these unique, high performance Ford Mustang coupes will go for well over $100,000. Update: The gallery above has images of the Saleen SA-30 Mustang along with the other two new Saleen SA-30 vehicles. Click any thumbnail for a closer look at all of the new Saleen models. This story is updated on May 11, 2018.